March is National Craft Month and to celebrate Jo-Ann Fabric and Craft Stores asked me to create a project based on some of this spring’s big trends in crafting*. You’ve seen these trends all over the Pinterest craft boards, radiant orchid, nautical, floral and geometric. I knew what I wanted to make right away, but Jo-Ann makes it easy for you to get inspired to do your own spring project with a $5 off $25 or more purchase coupon and a spring crafting inspiration website. Now, what did I come up with? Well, I am a big fan of the nautical striped t-shirts you see in the stores everywhere these days, I think I have enough to wear a different one every day of the week. But I wanted to do something to dress one of them up and make it a little different. 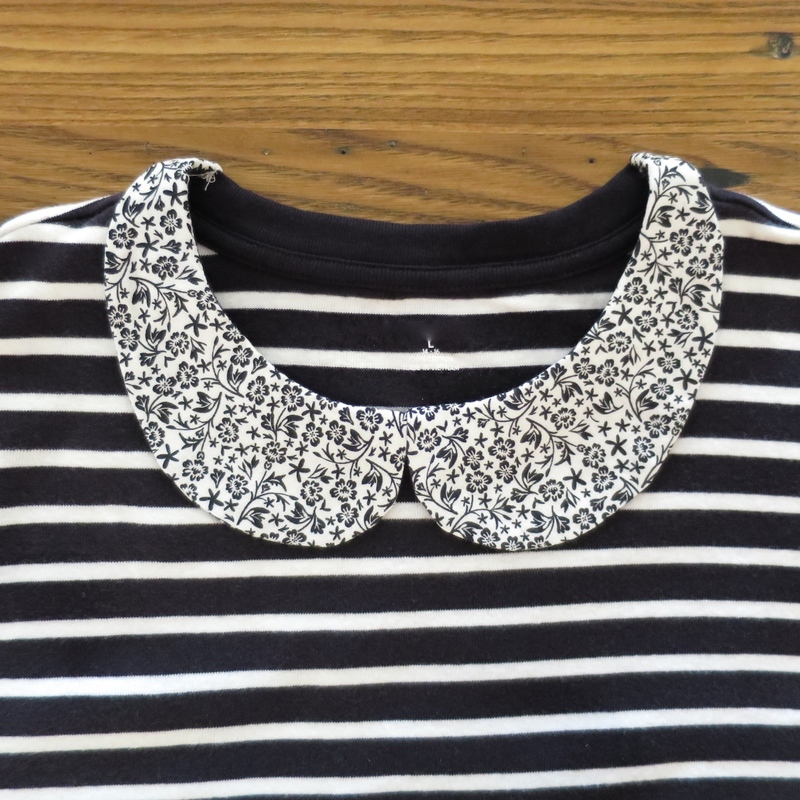 So, what I did was add a sweet, floral peter pan collar. 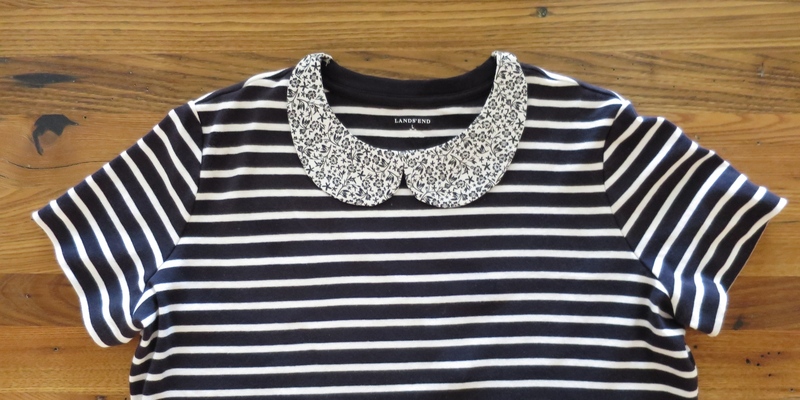 The collar takes the t-shirt up a notch from everyday to a little special. I love the mix of the two patterns and the mix of the two trends, nautical and floral. I kept the floral and stripes the same colors, but you could add a pop of color in the floral pattern too. I was a little intimidated by this project, but I have to say, once I got started on it it was a lot easier than I expected. You can see any picture in this tutorial bigger by clicking on it. t-shirt – you want a good quality shirt where the neckline won’t sag from the weight of the collar. Also you don’t want a super tight neckline. 1. Wash, dry and iron the fabric for the collar. You may want to wash and dry the t-shirt too incase of shrinkage. 2. Create your pattern (This is the trickiest part of the whole project.) 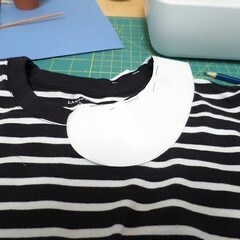 – Place a piece of paper inside the t-shirt and draw out the shape of the neckline. You really only need to draw about 2 inches past the shoulders seams to the back. The reason we are not going all the way around the collar of the t-shirt is because you still need the stretch of the t-shirt to get it on and off. 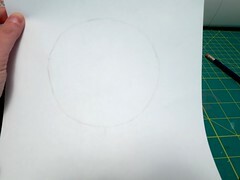 Sketch out the shape of your collar on this same sheet of paper. You really only need to do one side as you will use the same pattern for both sides of the collar to make sure they are exact. Err on the larger size. I ended up doing this step twice because the first collar was about 1/2 inch too small. Then add 1/4 inch around the collar for the seam allowance. 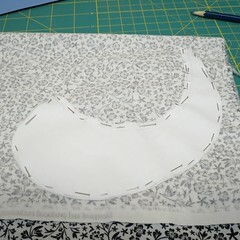 Cut out the pattern along the seam allowance lines you added. 3. Check the collar pattern for fit (This step will save the the heartbreak of cutting into your fabric and not having the collar look right.) – Fold the seam allowance at the top of the collar pattern down, you may have to clip to the stitching line to get it to fold correctly along the curve. Pin into place on the t-shirt. Try it on! It wasn’t until after I tried mine on that I realized I wanted a bigger collar. 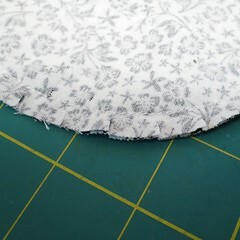 If everything is the way you like it, carefully unpin and unfold the paper pattern. 4. 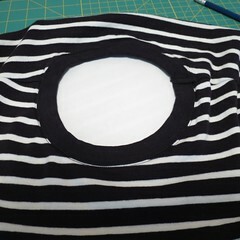 Cut out and sew the collar – Fold the collar fabric in half with the right sides facing in. 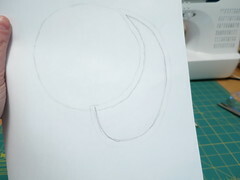 Pin the pattern through the two layers and cut out. 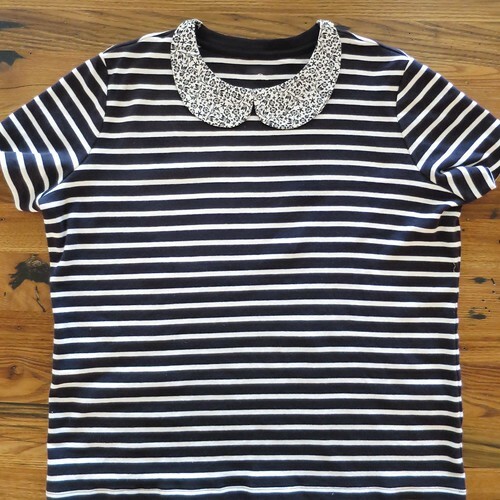 Repeat for the second collar piece. With the right sides of the fabric still together, sew the bottom of both the collar pieces using a 1/4 inch seam allowance. 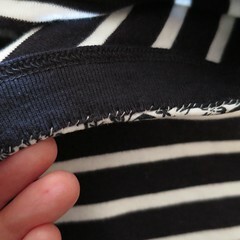 Since I knew I would be clipping the seam allowances to get nice curves, I sewed my seam twice for extra security. Clip the seam allowance about every 1/2 inch. Turn the collar pieces right side out. Iron them flat paying special care to push out the curves. At this point you could topstitch around the bottom of the collar pieces, for a slight more finished look. I didn’t, but may go back and add it. 5. 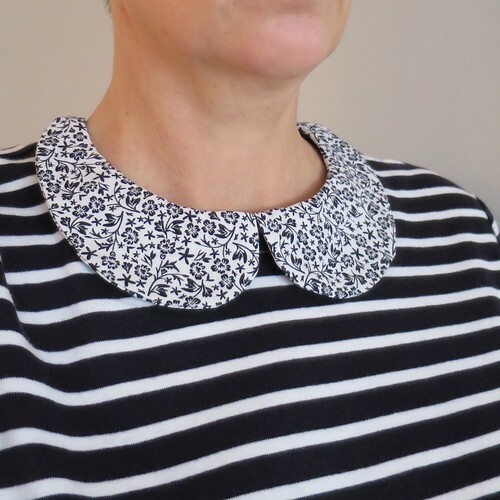 Sew the collar on – Fold the seam allowance along the top of the collar to the back of your collar pieces and iron down, you may need to clip the seam allowances a bit. Make sure that the two collar pieces are mirror images of each other when you do this step. Pin the collar to the t-shirt so the fold at the top is just above the top of the t-shirt collar and two pieces meet in the center front of the t-shirt. I ended up not taking my collar back any further than 1 inch past the shoulder seam. 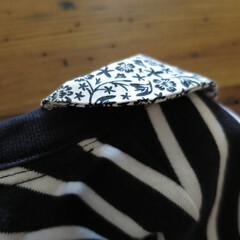 This meant I had to do almost no clipping of the top seam. Whip stitch the collar on to the t-shirt by hand. I found stitching the top corners of either end of the collar down just a little bit helped it lay nice and flat. Iron flat. 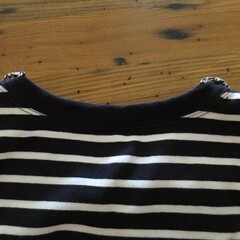 Once again, you may chose to do a row of topstitching around the top of the collar once it is sewn on. Here is how it looks finished from all sides. *Disclosure: This post is part of the Jo-Ann Fabric And Craft Stores® National Craft Month campaign. I received compensation for it by way of a gift certificate to buy supplies; however I was not told what to make or say, that is all me. 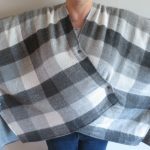 5 years ago by Kat in Needlecraft , Projects , Sewing , Sewing Projects | You can follow any responses to this entry through the RSS feed. You can leave a response, or trackback from your own site. I like how you left the factory neck finish. 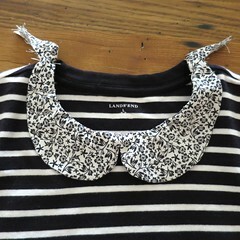 It gave foundation and support to the collar. Should hold up in the washer with no problems! I was glad I was able to leave the neck finish on as well & it is why I suggest not buying a t-shirt with too tight a neckline. It does give support & I didn’t have to worry about finishing jersey.